By Hongkiat Lim in Gadgets. Updated on April 6, 2018 . The Apple Watch is reported to last only a day on a full charge (although there are reports saying that that may be an optimistic estimate), so if you are a power user on the iPhone, you probably might want to invest in a good Apple Watch dock for regular charging sessions. We did the legwork and dug up some of the best Apple Watch dock (also known as the Apple Watch stand to some of you) designs the Web has to offer so far. It’s still early days so some of these docks are still in the production and crowdfunding stages, but that doesn’t mean they might not be sitting on your desk one day. Here are some of the best Apple Watch Docks you should check out while waiting for your Apple Watch to get delivered. Here’s a stand that takes into account how flexible your Apple Watch band is. You can choose to leave your Watch horizontally or vertically on the stand. Both orientations are angled in a way where you can see the watch face at all times. The cable is wound up and stored away from view, hidden inside the pole section of the stand. The base is designed to hold your iPhone should you require a dock for it too. The stand is about 8 inches tall and weighs only 18 ounces. This elegant, solidly built watch stand by Spigen comes with a dock made from flexible TPU plastic which is sturdy yet kind to your Watch. The dock is angled at 45 degrees for easy placement and equally easy viewing. The side of the stand has a cutout for easy cable management. Overall, the stand gives off a polished, classy look. Spigen’s Apple Watch Stand S330 is available only in silver. The Native Union DOCK for Apple Watch is an ambitious attempt at minimizing the size of a dock. The rotating arm allows the Apple Watch to be angled at any degree that is comfortable for viewing and the design does not play favorites with any particular buckle or strap design. You can choose to place the dock on either side (left or right) or let it lie flat on a surface with the Watch resting on top. It’s a charging dock with integrated MagSafe cable management for easy storage, and a protective casing for your Apple Watch – perfect for the Apple fan who is always on the move. The rigid protective cover comes in bespoked leather, available in black and tan, while the interior is made up of EVA foam and microfiber lining. WatchKeeper has a 12-month warranty and ships worldwide for free. Here’s a different take on how to keep your Apple Watch charged: a wireless powerbank; no cords, no fuss. The powerbank is a 2000mAh lithium polymer battery which can fully charge your Watch four times. Just place your watch on the powerback for wireless inductive charging. The powerbank is only 1cm thick and is available in a variety of materials. Choose the type of material you want your power bank to come in: wood, marble, rose gold, gold, aluminium (silver/space gray), marble or stainless steel. Prices may vary. For a clean and neat stand that lets you keep using your Watch while docked, try HiRise’s stand for the Apple Watch. Available in Silver and Black, this stand stands 9.5 cm tall and weighs around 6.65 oz. It has a leather landing pad and a non-slip rubbery base, both designed to keep the Watch in place. Silicone accents ensure that your buckles and bands do not get scratched when docking or removing your Watch. Although the stand itself is made from aluminum, allowing to have it in one of three colors – silver, black and gold – the dock where your Watch sits to charge is made from hand-finished walnut. Moduul also has a small sticky base which lets you dock, use and remove your watch easily, with one hand. Moduul is also compatible with the Pebble Time watch. If you can readily bypass an elegant stand to opt for a more pragmatic dock, check out NightStand by Elevation lab. This silicone dock with a matt finish can be mounted on any surface, horizontally or vertically, with the use of adhesives (much like those used with GoPro cameras). With NightStand, you don’t have to slide your Watch in at an angle or from the side. It is designed so you can still dock your Watch even if you are half awake. NightStand is available in three colors: red, black and blue. At the time of this writing, AWDock is still en route to reaching its Kickstarter goal of €39,000. While the design is nothing to shout about, OOCKZY, the company behind this dock design focuses more on the material used instead. Each dock is machined from a solid block of aluminum — no clamps, no screws — then polished, glass pearl blasted, then anodized (aluminum), or given a mirror polished finish (stainless steel), or given a 18K gold-plated finish (gold) for one of the three final looks. Nomad’s stand is a try at a minimalistic and elegant version of an Apple Watch Dock. Machined from aircraft-grade aluminum, this stand has the cable-routing channel worked into the back side of the design. The copper alloy base gives it the balance and weight it needs to keep upright. If you like this stand, do check out Nomad’s alternate offering, the Pod for Apple Watch ($59.95), an 80g, 7.2cm by 2.5cm pod that takes up less space yet still gets the job done. NuStand is offered as part of a funded Indiegogo crowdfunding campaign for the NuDock, a power station lamp that powers not only your Apple Watch but also your iPhone. If you don’t want to get NuDock, you can opt for the NuStand, which is a standalone dock for the Apple Watch. NuStand is made of aluminium and available in anodized gold, silver and space gray. It is close to 10 cm tall. The 7 cm by 7 cm base has a microscopic suction pad to keep the stand steady in place. This Watch Dock is actually part of a larger, fuller collection of organizers. Composure consists of a phone bed, watch dock and an organizer bed, which can be purchased separately or as a group. Each section can be connected magnetically. The setup is made from walnut and comes complete with soft cork inlays to give your phone, cards, keys and sunglasses soft bedding to rest upon. The Apple Watch though will be held on by its charging magnet. Modeled after a pocket watch design, this handmade pocket stand can be propped up to hold your Apple Watch while it charges, or folded in to store your magnet charger for easy handling. Its 4.2 in x 2.5 in and 0.6 in dimension allows for easy storing in a pocket or a bag. The stand comes in cherry wood, walnut and mahogany, and all with a 2-year warranty. Another handcrafted design, DODOcase’s take on the Apple Watch dock hails from San Francisco and is available in California American Walnut. Aside from the sturdy wooden stand, this stand also comes with a solid steel base as a foundation. The structure itself has specially carved areas to fit the cables of the MagSafe charging magnet, and it is designed to allow for easy coiling of the cable. Dual is a charging dock for your Apple Watch and iPhone. It comes fitted with a Baltic Birch tray, classic bookbound cover, and extra storage space for cables, straps and headphone. When you need to be on the go, just close up the organizer like you would a book. Note that this dock is not suitable for the Apple Watch with Milanese Loop or Link Bracelet strap. The docking surface is made of aluminum and leather accents to provide added protection for your Apple Watch. It stands at 4.64 inches tall and weighs 3.86oz. It comes with a 1 year warranty. Available in silver, black and a mix between silver and mahogany, this W1 Single Stand is suitable for any Apple Watch. The W1 single stand charges the Apple Watch, while the W2 dual-dock design allows for simultaneous Apple Watch and iPhone charging. To also charge your iPad at the same time, get the W3 triple dock. Duet is an ongoing Kickstart campaign and is composed of a dock for the Apple Watch and your iPhone. Crafted from a solid aluminum block, Duet is locked together by magnets, but can be used separately. When detached, the nanosuction pads under the base of the Watch dock give added stability. Duet is available in space gray, silver and gold. 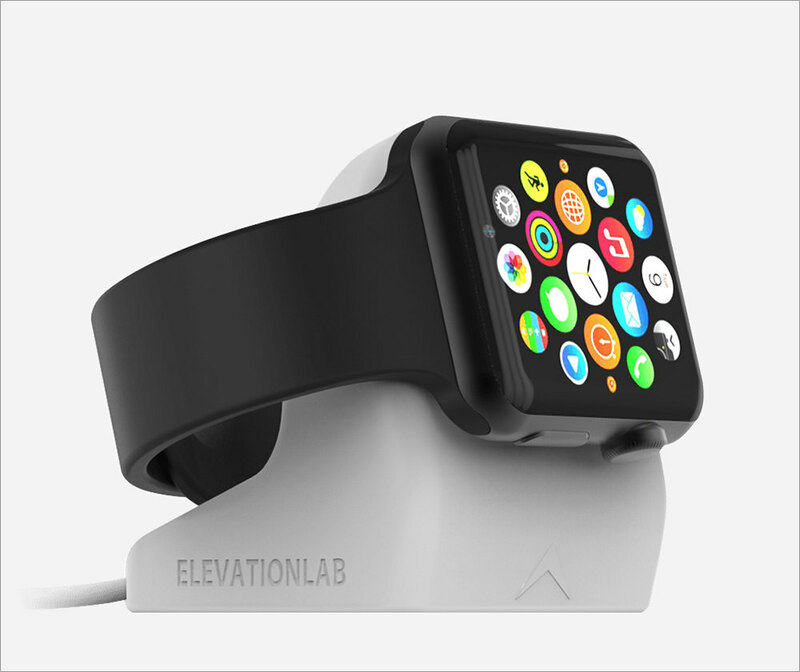 BandStand lets you choose how you want to place your Apple Watch, angled or facing upwards, and lets you charge your other Apple devices simultaneously. At the time of this writing, BandStand is only available for pre-order and all other information about it, including its price, is still not readily available. If you don’t want to buy a watch stand, you can 3D-print your own. Follow the link to get the plans to print this portable version of a watch stand. To prop it up, just use a credit card or a card of the same consistency. The design also allows for easy cable management.